Ok...apologies first. It's been almost 7 months since I've made an installment to the Orrville Football Playoff History series. If you're new to the site in the past few months, or if you're a younger Red Rider fan (or current player) please check out the link. Gain some appreciation for the teams that came before you. I knew it had been a while, but had no idea it was before Christmas since my last one. That's unacceptable to me. This was a project that gave my blog life, and a purpose, and it deserves more than back burner status. So we'll knock out a few more years leading up to the 2009 football season, and I'll work more in during football and basketball season. OK? OK. The 1988 football season was a year of beginnings & endings. It was the beginning of the Coach Mac era at Orrville, one that would eventually produce a state championship. It officially marked the end of the Mo Tipton era, one that saw unrivaled dominance and a place among Ohio's top public school football programs. It was also the last of five straight seasons that saw Orrville teams achieve 10 wins or more. It also saw the beginning and end (thankfully) of the dreaded "Red Rider" helmet logo. 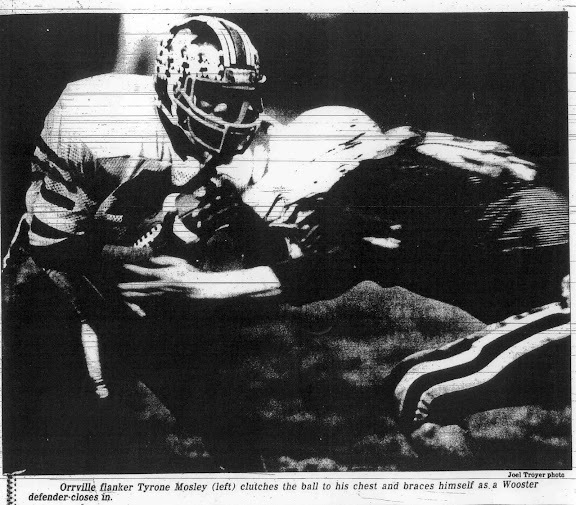 We've covered that in a previous post, but it's a quirk of Orrville uniform history of the last 25 years that's worth revisiting, and quickly putting to bed. 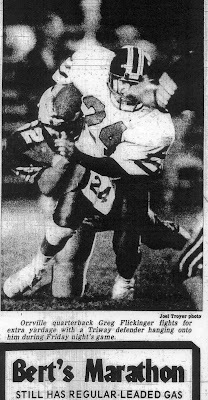 Lastly, the 1988 season served as the swansong of the All-Ohio League. In 13 seasons of the All-Ohio Conference, later renamed the All-Ohio League, Orrville won or shared 10 league titles, including the last 5 outright league titles in a row. In those final 5 seasons of the AOL, Orrville was 29-0 with 17 shutouts and outscored fellow league opponents by an amazing score of 983-97. That's an average score of 34-3. Highlighted for emphasis. Read that entire paragraph again, let it sink in. It simply will never be equaled. What an amazing run. It's stuff like this that creates tradition. 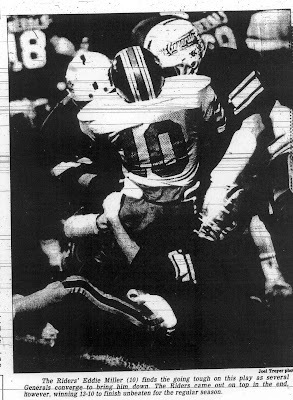 The '88 season began with a very intersting opponent..the Crusaders of Steubenville Central Catholic, with the Rider making the trek to Harding Stadium in Steubenville for the encounter. I'd venture to guess it was the farthest we've ever traveled for a regular season road game. Well, that game was a win, and so were the other 9 games that season. A typical Orrville team, tough defense, and playmakers on offense. What wasn't typical was the signal caller, Greg Flickinger. He transferred from Norwayne (has Orrville ever had another QB transfer in from a county school...and play?) and stepped right into the QB role. He also wore the unconventional QB uniform #23. I have a soft spot for any QB that wears a number in the 20's. Like Doug Flutie or Bernie Kosar in his days at the "U." I can't think of any recent college QB that wore a number in the 20's. I'm pretty sure that the last Orrville QB to do that was Marc Shupp in 2002 or so. I think he wore #23 also. 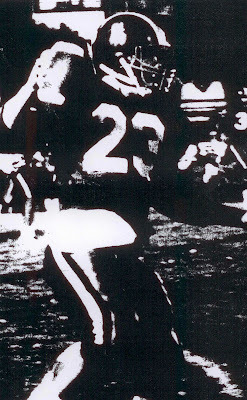 What is odd is that in at least one game, Flickinger appeared to wear #24, but was #23 in every other picture. I wonder if this was just a identification error by the photographer. The picture above and this one (PS - get your leaded gasoline at Bert's) were both from the Triway game, which was near the mid-point of the season. And I recall seeing pictures from earlier in the season, and he was #23 then, and was #23 in games after Triway. So it appears he changed numbers for at least one game in the middle of the season. I'd think he wouldn't have gotten the #24 towel made for just a temporary jersey, but maybe I'm underestimating the power of the screen printed waist towel. Can anyone help me on this? 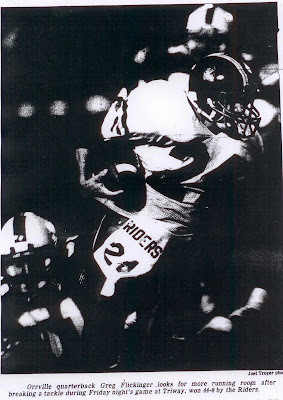 The Riders put the wraps on their 4th undefeated regular season in the 80's with a 13-10 win over Wooster, running their regular season win streak to 20 games (it would end at 23 games the following year) and securing the Division 3 Region 10 title. Their first round playoff game (regional semifinal) paired them against the Lions of Orange (Pepper Pike). The game was played at Fawcett Stadium over in Canton. In the final 8 regular season games, the Rider defense only gave up 31 points...TOTAL. In their 1 playoff game, the gave up 41 and over 400 yds of offense. The Rider defense had not met a team with the passing game that Orange brought to Canton, and they had a very strong run game as well. Plain and simple, they were a very balanced attack and our only defense was to try to keep up with them on the scoreboard. It came down to which team scored last, and on this night, it was the Lions. Orange had a very balanced attack, and held a big size advantage on the line. The Rider defense couldn't get a stop when it mattered. 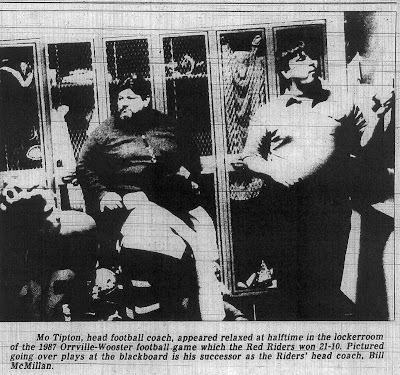 Here's the article as it appeared in the Courier Crescent on Thursday November 17, 1988. Orange - 19 yd run by Galen Greathouse (Volker Blankenstein PAT was good), 7-7. Orange - 19 yd run by Marcus Layton (Blankenstein PAT was good), 14-7. Orr - 88 yd kick return by Tyrone Mosley (PAT missed), 13-14. Orange - 28 yd TD pass, J.R. Haynes to Merrick Norris (Blankenstein PAT was good), 21-13. Orr - 11 yd TD run by Haley (2 pt conversion was good, Flickinger to Tim Shonk), 21-21. Orange - 6 yd TD run by Haynes (2 pt. conversion was good, run by Haynes), 29-21. Orange - 13 yd TD pass, Haynes to Norris (PAT missed), 35-21. Orr - 11 yd TD pass, Flickinger to Shonk (PAT missed), 35-27. Orr - 2 yd TD run by Haley (2 pt. conversion was good, run by Flickinger), 35-35. Wow. What a back and forth game, and what a 4th quarter. Thirty four of the games' 76 points were scored in the 4th alone. Stats on the game showed the Lions with 413 total yards and 28 first downs, while the Riders only mustered 242 yards and 10 first downs. From those totals alone, you'd think the game would have been a blowout. 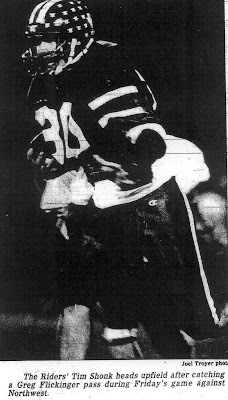 Both feature backs had amazing games, with Marcus Layton amassing 258 yards on 48 carries (5.37 yards per carry) while Orrville's Tyrone Mosley (one of three 'Smurfs' along with Eddie Miller and Tony Sims) gained 209 on just 19 carries (11 yards per carry). For the game, Tyrone had over 300 total yards. This was, and still is, Orange's only state playoff appearance. They beat Lima Bath the next week for the regional title, but were defeated in the state semifinals by Akron St. Vincent-St Mary (21-14) who went on to beat Ironton for the Division III title. Skull Watch. Another year of mixed skulls, sometimes big and sometimes small. We're getting to the end of the road for the big skulls, as I certainly don't recall them in the 90's. Sounds like the supply of big skulls from the Mo days were used up and then never replenished. We currently have 2 coaches (Mosley and Haley) that were part of the big skull regime. I think a push needs to be made to bring back the big skulls on the helmets. Maybe not exclusively, but maybe for players who received the various weekly awards (offense, defense, 110%, big hit..etc. ), it could be like a badge of honor. Reserve one side of the helmet for the big skulls and the other side for the smaller ones. I think this deserves it's own poll. Which do you prefer, big skulls or small skulls. Pictures below, poll is at the top of the page. Let the battle commence. Click each image for a larger version. Lastly, this is a nice picture from the Wooster game, it beautifully illustrates the Wooster helmet that I loved to much. I wish they'd go back to something like this, instead of that borrowed Wisconsin logo they use now. And if you look real closely, they also used big skull stickers, but theirs were a darker color (black or blue I'm guessing) to offset the white helmets. Loved the "GENERALS" across the front of the jersey too. I guess that's it....1988 is in the books. The year of the drought in Ohio and the year Elvis was supposed to return (remember 8/8/88??). On to '89. You are on fire Cobra, well done. '88 was great. A few things about the Fall of 88 season. You glossed over the Stuebenville CC game...a Saturday night game no less. Three keys plays were Sean Ray "stealing" the ball from a kick returner and running our kick off back for a TD, a 50+ yard TD run by Jason Haley in the last seconds of the first half (76 power if I remember correctly) and CC missing an extra point with 3 minutes left that would have put them up by 1. In the end Jeff Leggett kicked a game winning field goal as time expired. Another game worthe mentioning was the 7-6 win over Manchester, the de facto AOL title game. Manchester scored first and went for two. I batted the pass down on the xp to set up a fantastic finish. We struggled all night against their 5-3 defense, but after a turnover late in the fourth we marched down and scored. Leggetts's helicoptering extra point was the difference. Love your blog. This year 88 is obviously near and dear to my heart. PS 24 in those pictures was Jason Goodard...indeed they were mislabeled. Thanks for filling in the blank Kevin....in the playoff series, I try to focus on the playoff games first and foremost, but we're entering a stretch where we had a lot of "1 and dones"....so i tried to stretch it with a little more info from the regular season....but other than old Courier articles, I dont have much personal account to go on. That's why I love to read comments such as yours. Thanks for clearing up the number issue of Flickinger. I had my doubts that he was #24 and #23. A Saturday night game? I bet that was really odd. First game of the season, and a Saturday night game to boot. Had to be quite an odd routine. I'm guessing they share the same stadium as Steubenville, thus the Saturday game.